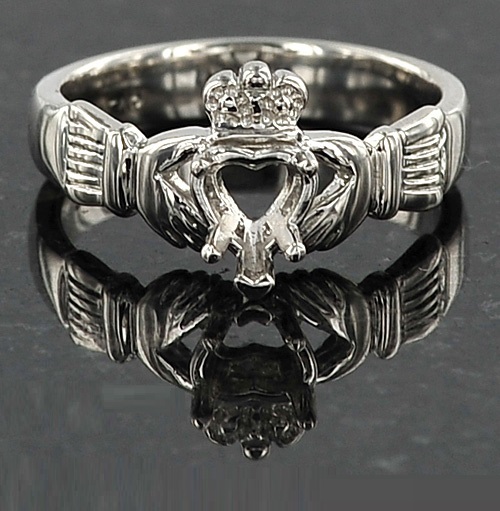 Symbolic Claddagh ring depicts two hands that are holding a crowned heart. Each element of this Celtic symbol is combined with the categories of love (the heart), friendship (the hands), and loyalty (the crown). 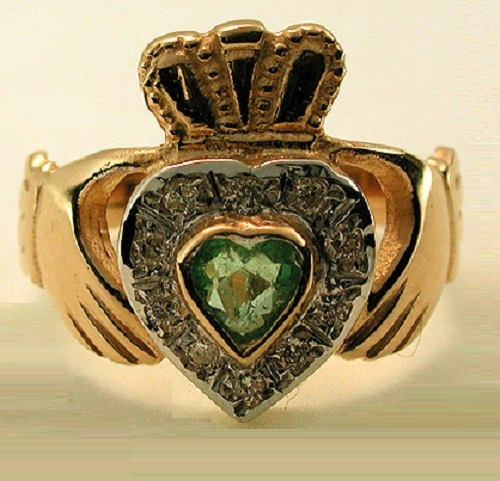 Among Irish jewelry Claddagh Ring is most famous. 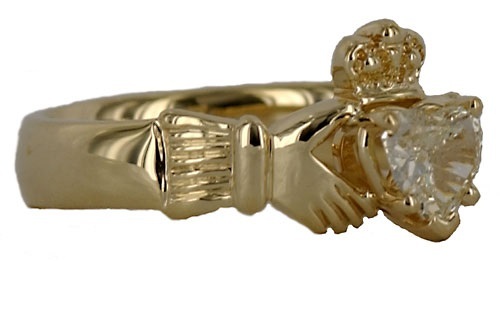 The ‘Claddagh’ ring takes its name from the Irish village. It is given as a sign of friendship, and as a wedding ring. One of the stories associated with the ring goes as follows: A young man Richard Joyce, a native of County Galway left his home to find work abroad. It happened back in the seventeenth century. The ship on which he traveled was attacked by Algerian pirates, and Joyce was taken into slavery. On the eastern market he was sold to one Moorish goldsmith, from whom Joyce learned to make jewelry. But at the request of the British Royal Government, all English slaves were freed. Ireland was then a British colony, and Joyce was also a British citizen. The jeweler loved the talented guy and even offered him to marry his daughter. But Joyce declined, because at home he was waited for his bride, missing whom he created a golden ring in the form of two hands holding a heart with a crown. Having returned home, he gave the ring to his faithful friend, who was still waiting for him all these years. They married and settled in the village of Claddagh. Richard Joyce worked as a jeweler. The fact remains that the most ancient surviving rings are labeled «RI», a goldsmith named Richard Joyce (born. Richard Ioyes) really existed. It is also noteworthy that the stigma of the jeweler includes an anchor – a symbol of hope. 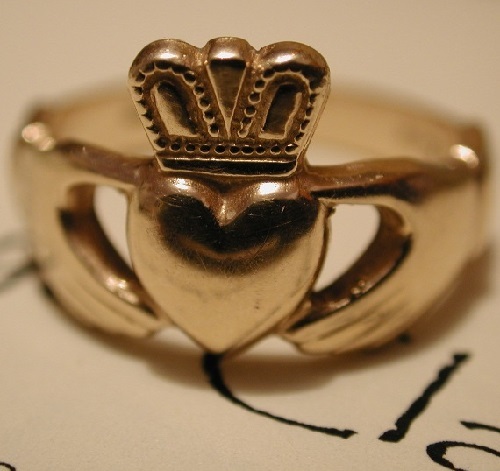 It is believed that after the closure of jewelry shop of Richard Joyce in the 1730s, production of Claddagh rings stopped, and was resumed a generation later by George Robinson (born. George Robinson). Later, it began to make such rings and other jewelers Galway. Another story involves a prince falling in love with a commoner girl. The prince fell in love with a poor girl, but her father did not believe in his feelings. 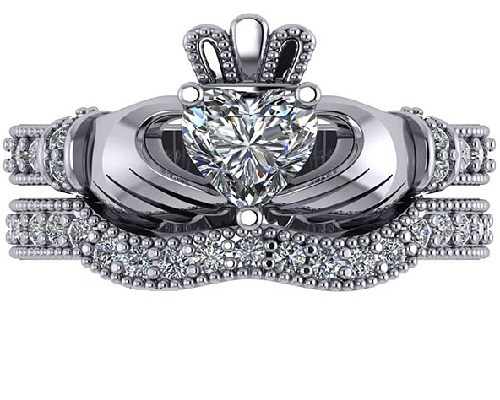 In order to prove his good intentions, the young man asked the jewelers to make a ring for him, as a representation of his love and marriage proposals. 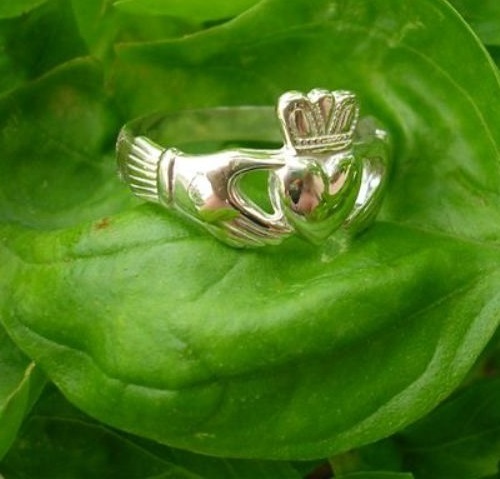 Thus appeared Symbolic Claddagh ring. 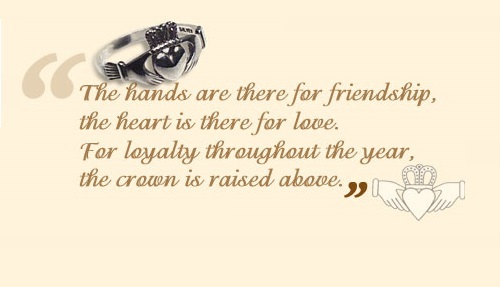 The Claddagh ring is of great importance in Ireland as a liability. This Celtic symbol is kept as a family relic. There are several ways to wear the ring. 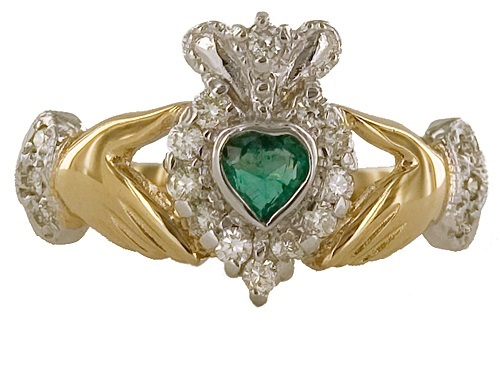 The ring on the right hand with the heart pointed toward the fingertips means that he or she is alone, but ready and willing to consider offers of love. 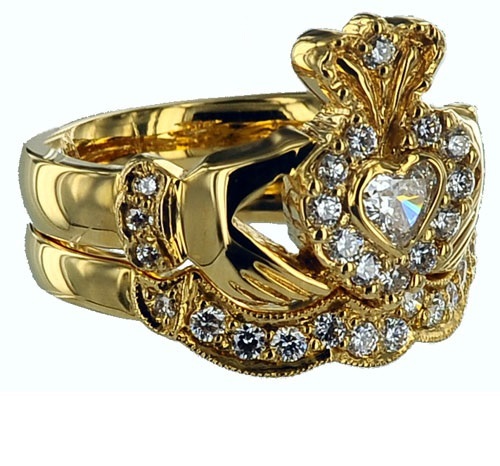 The ring on the right hand with the point of the heart toward the wrist, the wearer is in a relationship. 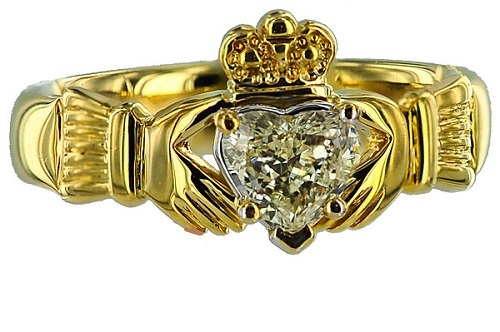 The ring on the left hand with the point of the heart toward the fingertips, means he or she is engaged. 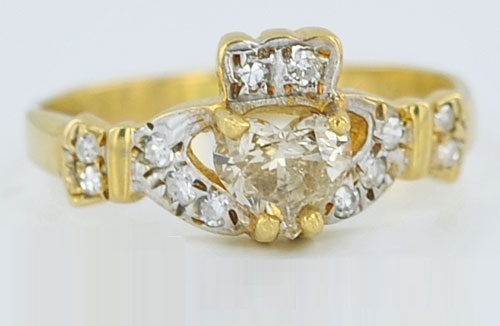 The ring on the left hand with the heart pointed toward the wrist, means the wearer is married. 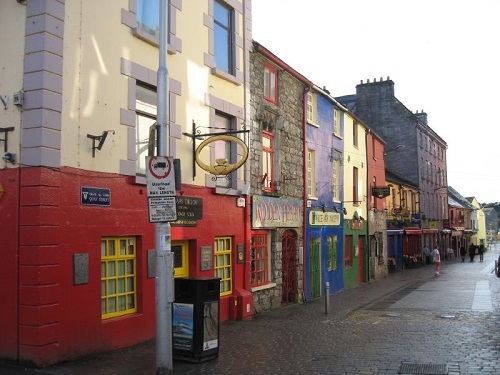 There is a Museum of Claddagh rings, known as “the smallest museum in Europe with the largest gift shop”. In it are stored rings, made in the workshops of Nicolas Bёrdzha, Richard Joyce and George Robinson. 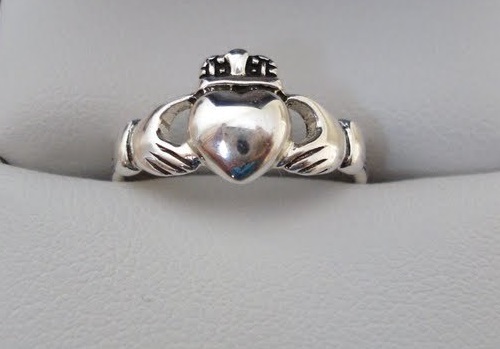 Also, it has the smallest existing Claddagh ring fit on the pad of the little finger. Rings for exposure are partly found in the process of archaeological excavations; one of the archaeological finds of ten rings of Dillon was worth a total of more than 6,000 euros. 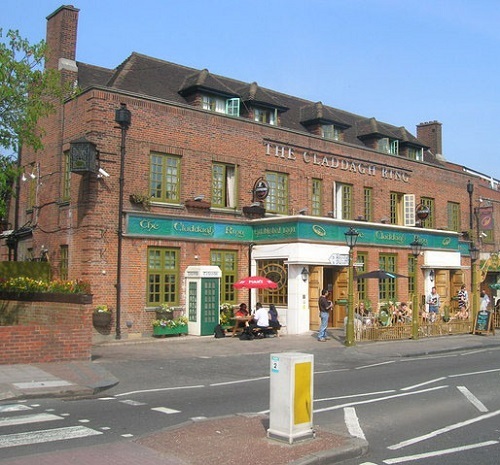 In London, there is a fairly well-known Irish pub The Claddagh Ring, founded in 1991. The pub, made in medieval wooden decoration includes the Symbolic Claddagh ring. 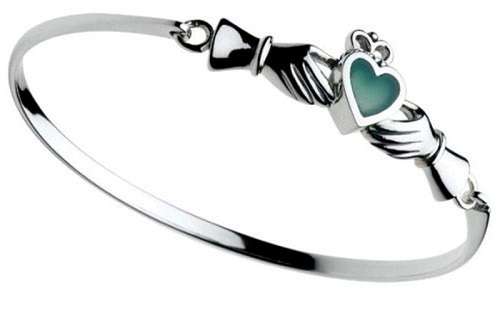 The Claddagh ring symbolism is also used in jewelry such as earrings, necklaces, tiaras, souvenirs. 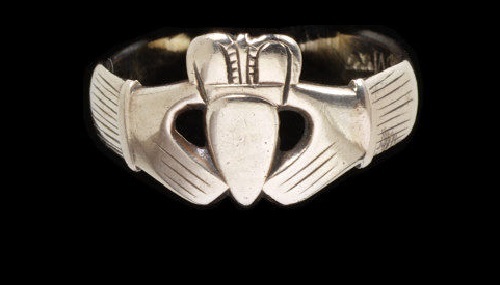 Claddagh rings can sometimes appear in films such as “The Doors” directed by Oliver Stone. In the television series “Buffy the Vampire Slayer” Angel gives Buffy a ring as a sign of love, he himself also has a ring. 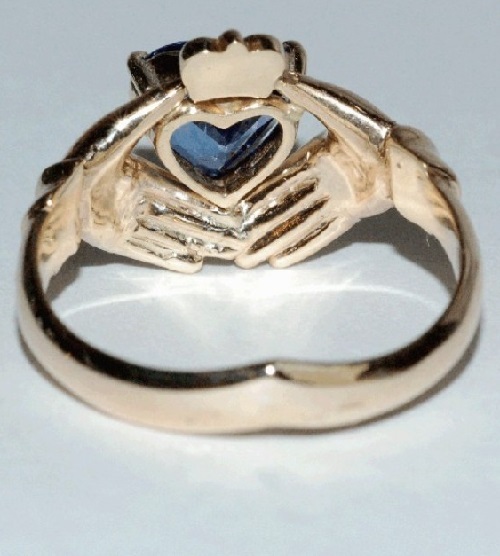 About the ring is sung in the song The Gold Claddagh Ring by Andy Stewart. And in the Old Claddagh Rings played artists such as, Margo and Dermot O’Brien. In addition, the mention of the ring is found in James Joyce’s novel “Ulysses», “Spells for special agents” by Robert Lynn Asprin and Jody Lynn Nye, “Kingdom of opportunity” by David Levitan, in “Vampirates. Demons of the Ocean” by Justin Somper, in “Dining Late with Claude La Badarian” by William Monahan, and other artistic works. The hero of the 2010 film “Leap Year” Declan O’Callaghan says that during a fire would have saved the wedding ring of his mother (“So that thing I’d grab if I had 60 seconds, it’s my mother’s Claddagh ring”).